Sgt. Peppers In The Sentinel - Sgt. Peppers Hot Sauces Etc. Guaranteed to raise a smile… a new specialty grocery store, Sgt. Peppers Hot Sauces, Etc., which boasts a wall of spiced goods, an assortment of cheeses, and a smidgen of the Beatles… while the store’s size is somewhat modest, its bottle collection is rather intricate. 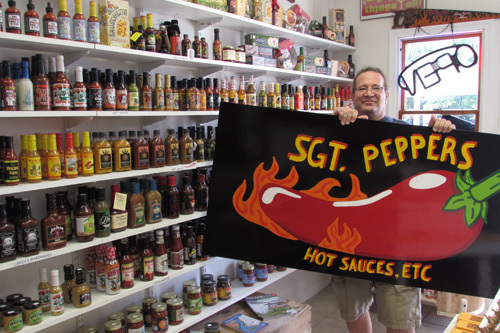 Proud to offer a wide variety of hot sauces, salsa, cheeses, BBQ sauces, spices, marinades, jerky, sausage and cured meats, pickles, pickled items, jams, gourmet crackers, dips, condiments, gift baskets & more. Looking for something extra-special? Please let us know! We're all about discovering new things... and stocking them. Copyright 2018 Sgt. Peppers Hot Sauces Etc.